Thanks to the success of ‘Danguard Ace’ and ‘Yamato’ made for Toei in 1977 and 1978, mangaka Leiji Matsumoto, who took the creative helm after Go Nagai had legal issues over the rights of ‘Gaiking’ – and left, came up with another soon-to-be classic from one of his comics in 1978: Capitan Harlock. This work was praised for its innovative story and animation both in Japan and Europe, but not with the same enthusiasm in the States – like most TV anime in the 80’s. After a first run of uncut and subtitled episodes aired on a Honolulu channel in 1979, Harlock was briefly released on cable. However the dubbing changed elements and names adding confusion to the plot. Only in 1985 Harmony Gold decided to buy again the TV rights for the US and redub along with ‘Queen Millennia’ (because the follow up of Harlock – called SSX – was way over budget) and thus created the new series ‘Capitan Harlock and The Queen of a Thousand Years’, a mash-up like their infamous ‘Robotech’ saga that included not one but three classics altogether: ‘Macross’, ’Southern Cross’ and ‘Mospeada’. Robotech worked, Harlock – sadly – not. Big leap to 2010! ‘Toei Animation’ announces a CGI movie based on the Harlock universe with an over the top budget – for a Japanese animation studio – of 30 million dollars and will be directed by mecha designer Shinji Aramaki, known for his two ’Appleseed’ movies in cel-shading and a CGI feature for the ‘Starship Troopers’ franchise (that now seems like a blueprint for Harlock). After a new promising trailer in 2012 the movie was finally released in 2013: produced by Toei and made by ‘Marza Animation’ – a CGI studio famous for the ‘Sonic’ openings in the SEGA games. 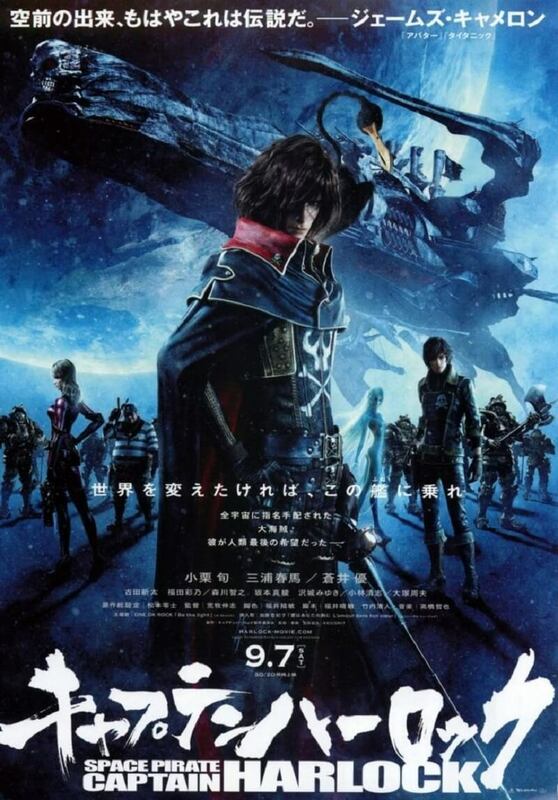 So Toei made it to finally sell ‘Harlock’ to the American audience?! After the first promising twenty minutes the answer is ‘yes and no’. Character and Arcadia design are truly inspired, except for the poor Yattaran who’s now a space trucker on steroids, but what seems awkward is trying to erase a myth like Harlock, that worked so well for forty years, to convey an annoying story of a siblings’ dilemma: to kill or not to kill the legendary pirate of the stars. The movie itself tries so hard, trying to make Harlock a mad hatter with a desire for intergalactic human apocalypse (because we’re not worthy –d’oh! ), but in the end he’s just in the background and barely gets along with the story. Nerd sci-fi terms and too many dark corridors try to convey atmosphere, but they just put to sleep. CGI sometimes is cool and sometimes is not: for those who usually watch anime know very well that CGI is not the answer and traditional animation implemented with digital paint and modeling like in ‘Macross Frontier’ or the newest ‘Yamato 2199’ is best to enjoy the ride. CGI animations shows or movies get old too fast – but characters like Harlock will be young forever. Let’s hope for a new TV show that will make amends. With all the love and care that Toei can do (and always did). Like making sushi with beef, the will to change and adapt a Japanese anime icon to an American lazy audience is baffling. We’re not in the 80’s anymore and, Dear Toei, we love and care for Japanese anime too – even in the US!!! So please, please do not go bankrupt trying to make ‘modern CGI anime for PS4 kiddos’ and remember that if even Pixar is not trying to make realistic CGI movies nowadays maybe there’s no need at all. Cool is not turning a funny character like Yattaran into annoying Rambo. Please do not destroy again our childhood memories of sailing the Arcadia with Harlock to a God-awful nightmare of ‘biker of the stars’ madness. Remember that an angry plethora of fans can turn a bad movie milestone into a solid-rock tombstone. We want a show to be proud of, with Harlock back in his throne of epicness, and sail again the stars under the ‘skull and bones’ flag of Arcadia. The flag of freedom!! !